Can AFOs help prevent falls? Studies suggest that ankle foot orthoses can improve balance in some individuals, so it might seem logical that they would also help prevent falls. But the medical literature has yet to reveal a direct con­nection between AFOs and falls risk, and as a result the issue has become a mag­net for debate. Images from the London Olympics were everywhere in late July and early August—on our televisions, our radios, our computer screens, and our smart phones. Flags were flown, national anthems played, and countries ranked by medal count. In so many ways, the Olympics are about the achievements of individual nations. But a closer look reveals a more complex picture. Orthotic laboratory managers, CAD-CAM technology experts, and lower extremity practitioners convened in Manchester, UK, in July to share ideas and experiences related to the automated design and manufacture of foot orthotic devices. 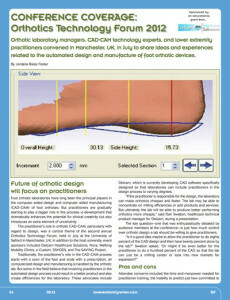 Foot orthotic laboratories have long been the principal players in the computer aided design and computer aided manufacturing (CAD-CAM) of foot orthoses. But practitioners are gradually starting to play a bigger role in the process—a development that dramatically enhances the potential for clinical creativity but also introduces an extra element of uncertainty. Computer aided manufacturing is anything but a one-size-fits-all proposition. Customers have a range of variables to choose from, and making the right decision in most cases depends on knowing what type of orthotic material the machine will be asked to handle. The use of technology to improve orthotic design is not limited to CAD-CAM applications, as demonstrated by University of Salford researchers in two presentations at the Orthotics Technology Forum. The fledgling field of additive manufacturing is still somewhat fragmented, as evidenced by the fact that the same technology can be described as rapid prototyping or 3D printing. But additive manufacturing’s profile is definitely on the rise, and its advocates are optimistic that lower extremity clinical applications are right around the corner. A new technology, the load cell, can be used to assess rollover characteristics of prosthetic feet in a variety of walking envi­ronments. Load cell analysis can help identify premature foot-flat and dead spots and determine the effects of energy stor­age and return designs on amputee gait. As researchers explore the possibility that idiopathic toe walking has an underlying neurologic cause, clinicians continue to refine treatment strategies to keep ITW patients off their toes. Orthotic devices play a key role, with lower-profile devices growing in popularity. Inconsistent findings from laboratory stud­­ies have made it difficult to deter­mine which gait alterations are specific to diabetic peripheral neuropathy and which also affect diabetic patients with­out neuropathy. Body-worn sensor tech­nol­ogy may help clarify the distinctions. Dose-response research refutes the com­mon perception that increasing brace wear time leads to muscle atrophy in patients with knee osteoarthritis. In fact, longer bracing duration appears to im­prove hamstring strength as well as in­creas­ing patients’ physical activity levels. The shift away from aggressive surgery to correct clubfoot in now all but complete, according to research published in July in the Journal of Pediatric Orthopaedics (JPO). The study shows the Ponseti me­thod is now the treatment of choice for the vast majority of practitioners and that increased understanding of the technique has resulted in better outcomes. Korean surgeons have developed an alternative to Achilles tendon lengthening for reducing plantar pressure and promoting wound healing in patients with diabetic foot ulcers. A subsensory level of mechanical noise delivered directly to the foot soles of healthy older adults during walking has the potential to normalize gait variability and possibly reduce the risk of falls, according to research published in July in Gait & Posture.